We give a formal specification and analysis of the security service of CORBA, the Common Object Request Broker Architecture specified by the Object Management Group, OMG. In doing so, we tackle the problem of how one can apply lightweight formal methods to improve the precision and aid the analysis of a substantial, committee-designed, informal specification. Our approach is scenario-driven: we use representative scenarios to determine which parts of the informal specification should be formalized and verify the resulting formal specification against these scenarios. 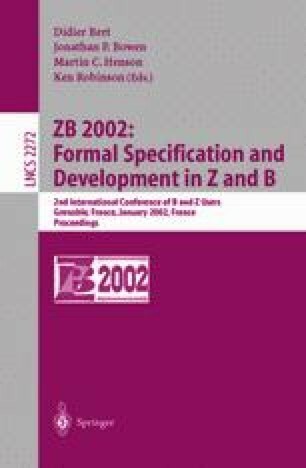 For the formalization, we have speci.ed a significant part of the security service’s data-model using the formal language Z. Through this process, we have been able to sharpen the OMG-specification, uncovering a number of errors and omissions. This work was partially supported by the Deutsche Forschungsgemeinschaft under grant BA 1740/5-1 “Formale Sicherheitsarchitekturen”.